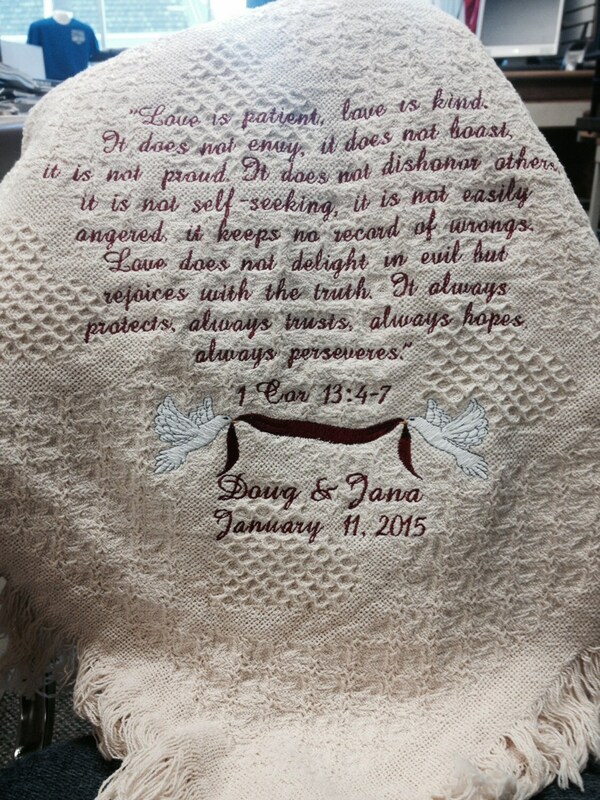 Celebrate the special day with a personalized afghan to commemorate the occasion. The honeycomb heart throw is available in natural or white. It is 100% cotton, double layered, and measures 48” X 60.” Machine wash in cold water on gentle cycle. 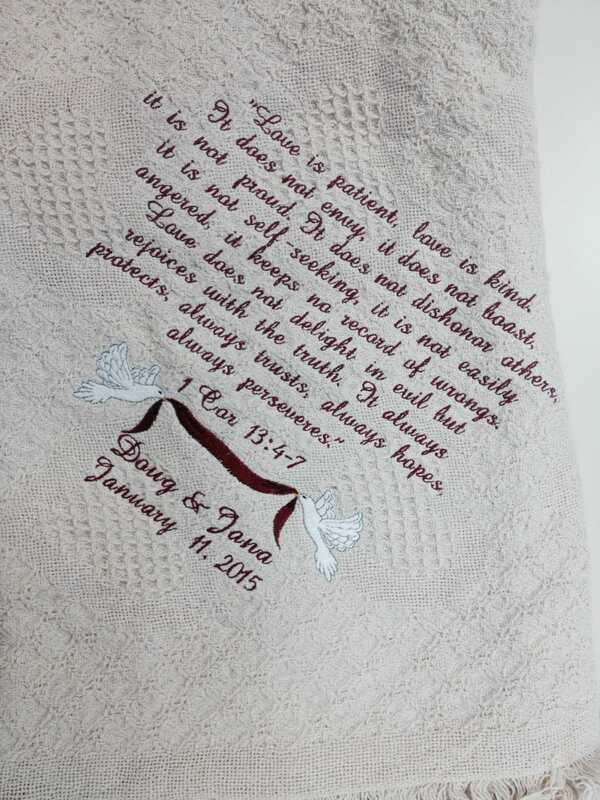 The scripture is 1 Corinthians 13:4-7 "Love is Patient, love is kind....." Underneath the scripture are two doves with a banner. The banner and lettering is sewn in Cardinal Red. The lettering used is Amazon Script. If you would like a different thread color than what is listed, send me a message and I'll see if I have that color available. 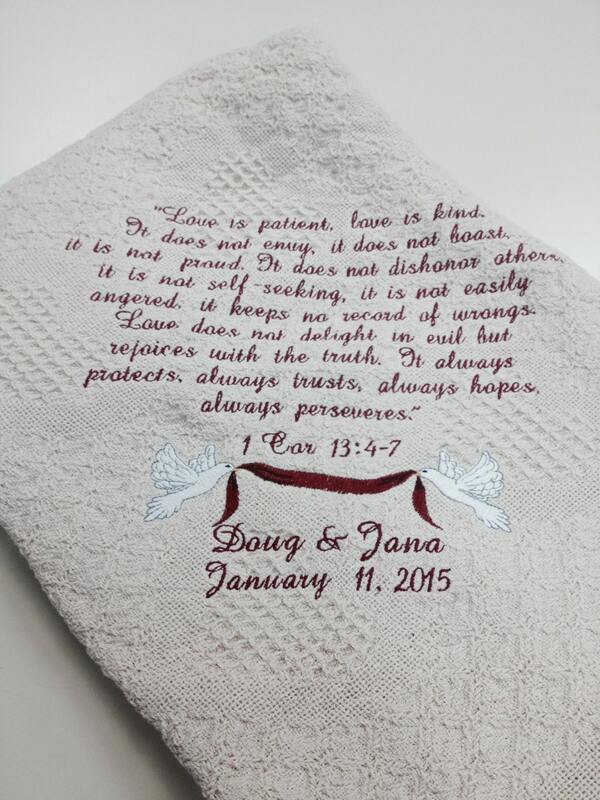 Please provide the names of the bride and groom and the wedding date in the buyer's note. Please allow 1-2 weeks for item to be ready to ship. If you need it quicker, message us and we will try to meet your deadline. The afghan is AMAZIING! Thank you so much for your beautiful work. I would and will recommend your Etsy store to everyone I can. Exactly what I asked for she loved it!!! Bought this afghan for my daughter's wedding. It was so beautiful and they loved it. Very fast shipping. I highly recommend..